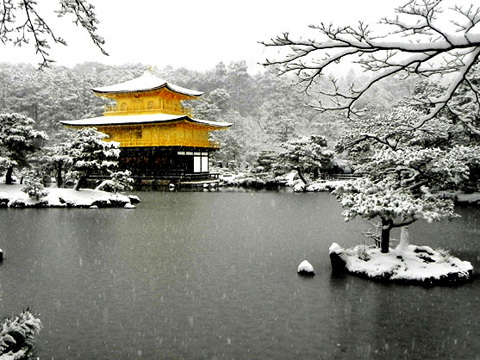 Kinkaku-ji (金閣寺, temple of the Golden Pavilion) and the garden complex was built in Kyoto by the Shogun Ashikaga Yoshimitsu (1358-1409) for his retirement in 1394. 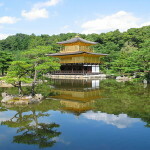 On Yoshimitsu’s death, his son turned the building into a Zen Buddhist temple known as Rokuon-ji, according to his wishes. In 1950, a trainee priest, Hayashi Yoken (a 21 year old university student) set fire to the building. He said that he “wanted to be big news” and “wanted to shock society”. However, the truth was much more complicated. He had a pessimistic attitude towards life brought on through his years of suffering with extreme dysphemia and a mother that placed extremely high hopes on him, as his father was a priest at the family temple. I believe the gap between Hayashi’s simplistic belief that the temple is a sacred place and the reality of the temple needing money to function, with the accountants (of the temple) wielding more power than the priests, was probably too wide for a pure young trainees mind. 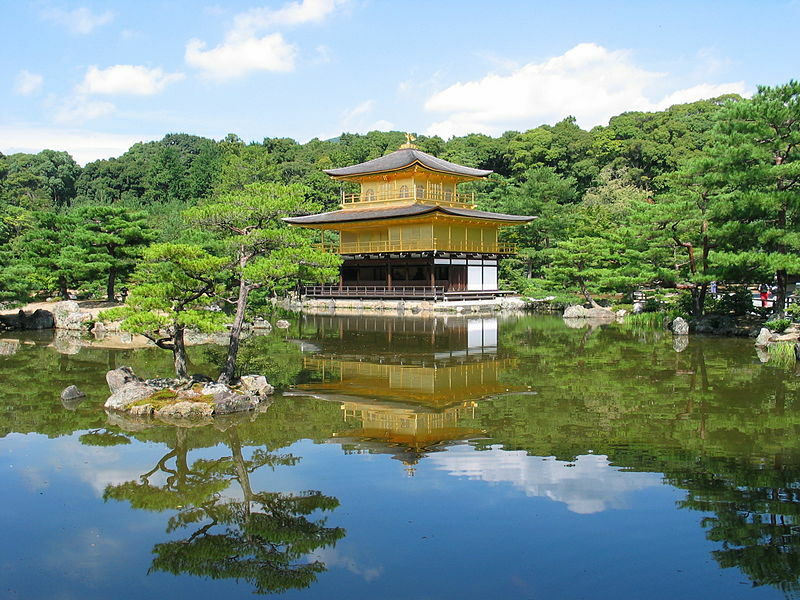 Yukio Mishima’s novel “The Temple of the Golden Pavilion (1956)” is based on this case. It is a good read, with Mishima analysing and providing an insight to the young trainee’s thoughts. The fire destroyed the building along with it a few national treasures, with only the Phoenix roof ornament and a small frame of Emperor Gokomatsu’s hand writing “究竟頂” (means “top”) from under the roof top surviving. 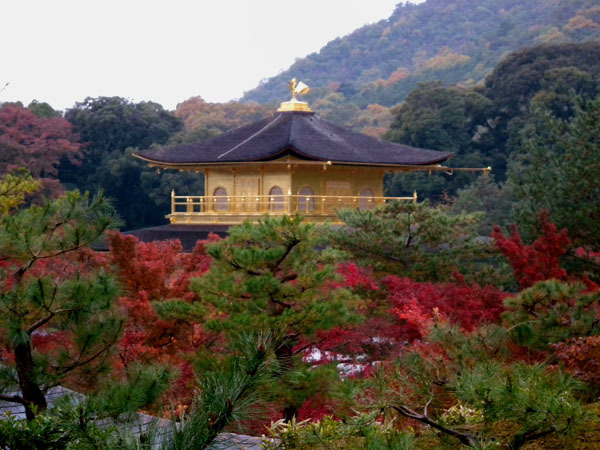 The Golden pavilion as we see it today, is not 600 years old, was built in 1955, as an exact replica of what Yoshimitsu once looked upon. The garden complex is an excellent example of the Muromachi period garden design which is considered as a classic age of Japanese garden design (600 years ago). The correlation between buildings and its settings were greatly emphasized during this period. The temple grounds feature a pond set in the middle with small islands, bridges, carefully trimmed trees, water falls, a tea shop and rocks all set at the base of mountain, which combine to create a beautiful world. 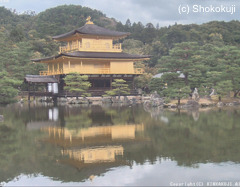 The pond also works as a mirror to double the beauty of the Golden Pavilion. The grounds have been well planned to look exquisite in the deep snow, in the lush green of spring, in the strong summer sunshine, and in the autumn leaves. 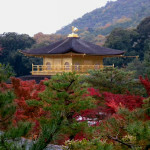 you will find what a true Japanese garden is here, so beautiful at anytime. 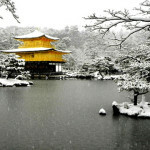 It is designated a National Special Historic Site and a National Special Landscape, and is one of the 17 locations comprising the Historic Monuments of the Ancient Kyoto World Heritage Sites.